The majority of the UID labels we ship are either white or silver in colour. Sometimes this doesn’t make sense; for example, we have a number of clients manufacturing night vision or similar equipment. It clearly isn’t sensible to stick a bright coloured label onto these products, but they are still required to have the UID mark. 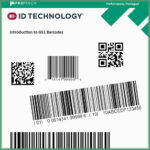 Sometimes, it makes sense to use direct part marking technology to engrave the UID mark right onto the part. For occasions when this isn’t practical, we have developed a black polyester label material that is designed for thermal transfer printing. The labels are manufactured in Nashua, NH and can be die cut in various sizes. Bearing in mind that the labels need to be durable enough to be able to meet the requirements of MIL-STD-130, they are made from 2mil polyester, with a matt thermal transfer printable over-laminate. The adhesive is one of our most aggressive, ensuring that the labels are able to completely adhere to a very wide range of products. We can supply you with printed UID labels that come with a verification certificate for each as well as blank labels in rolls if you prefer to print your own. Here at Winco ID we have developed a lot of solutions to help our customers with UID compliance. How can we help you?